The castle of Hohenschwangau and that of the fairytale Neuschwanstein castle frame the tiny hamlet of Hohenschwangau as it sits in its idyllic position on the edge of the Alpsee (Alp Lake) in Bavaria. 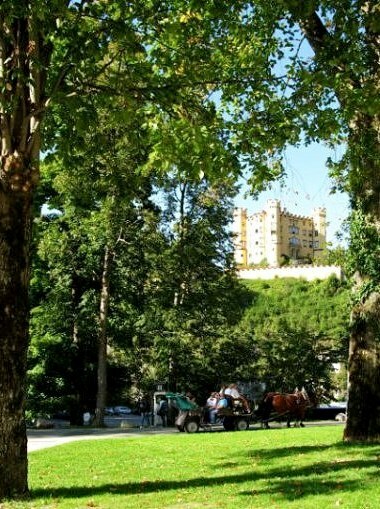 From ancient times castles have stood on the same positions of both Neuschwanstein and Hohenschwangau, which inspired it, but it took the ability to bring dreams to life that left us with the current wonderful heritage left by the Bavarian kings Maximilian II and his son, Ludwig II. 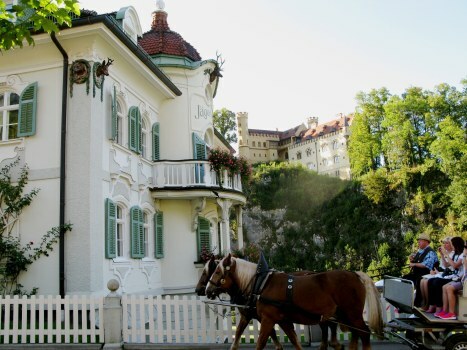 Hohenschwangau –'The High Country of the Swans' - is like a fairytale village itself. 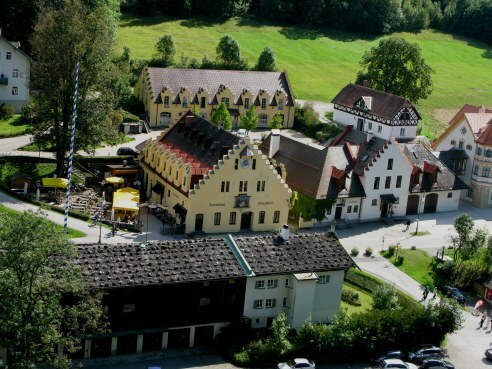 From whatever perspective you look, it seems as if it is a story-book village come to life. 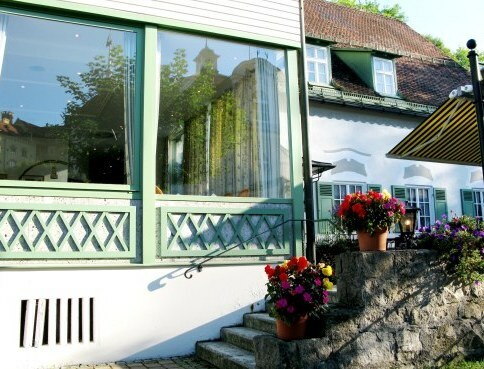 En route, once off the autobahn, the drive through the picturesque countryside of Bavaria is rural. The route takes you through beautiful small towns and villages so pretty that it explains why similar ones appear on chocolate boxes the world-over. On my first visit we had arrived late. The mountains dimmed the remaining daylight and started setting everything under a soft cover of mist. Soon it was quite dark. 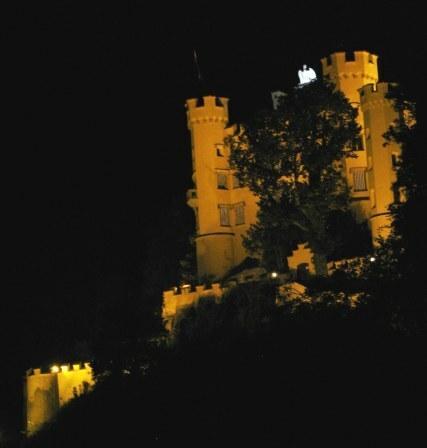 The castle of Hohenschwangau was illuminated. The eagle with raised wings atop the tower stared down on the town from its night eyrie. 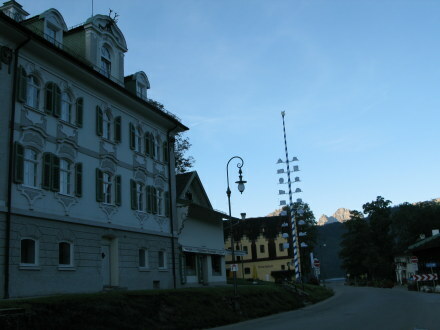 In the morning, Hohenschwangau Castle seemed a benevolent spectator on the township below. Most people only know of the hamlet through seeking out the castle of the same name – or more commonly, coming to view the beautiful castle of Neuschwanstein which sits higher up the mountains, and which at first sight appears tiny. Neuschwanstein was not designed to house the full court, but as a retreat for the King and his guests. Its size reflects this, as it covers just 150 metres (about 164 yards) atop its rocky perch. 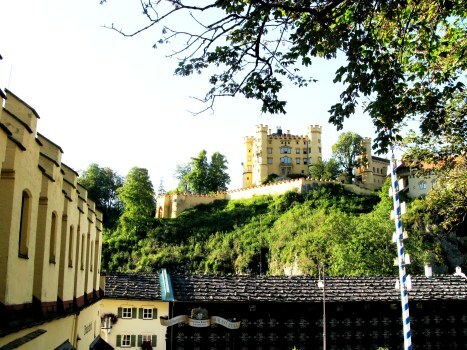 While the castle of Neuschwanstein was being built, Hohenschwangau swarmed with artisans, transporters bringing the building materials, and those providing other goods and services for the workers needs. According to a publication by Rauch in 1991, beyond the numbers of other workers and those provisioning for their needs - in 1880 there were over 200 craftsmen working on the building. 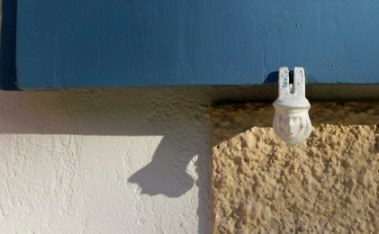 Due to the pressing schedules, work continued at night, illuminated by oil lamps. 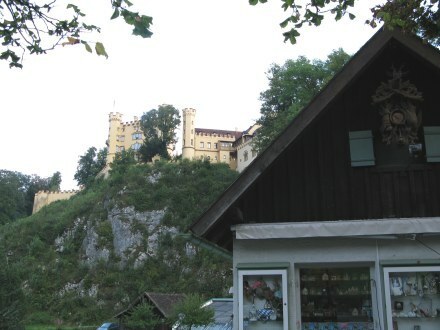 Prior to this massive influx of workers, a similar scenario took place during the building of the Hohenschwangau castle by Ludwig’s father, Maximilian II. 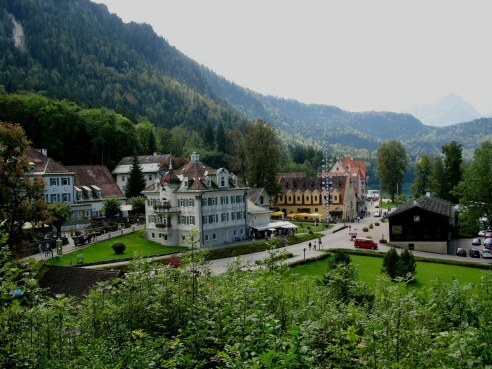 Of those who come to Hohenschwangau today, most are just making a pause on a short stop, with few actually staying there overnight. 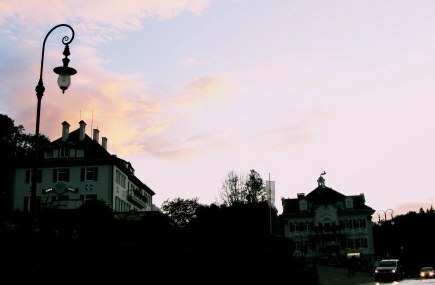 The result is that it is a charming and charmed place that is surprisingly empty after the tourists depart for the day. As I walked in the evening dusk, the streets were almost deserted - apart from a jogger, and a lady walking her dog – both being locals who greeting each other cheerfully. 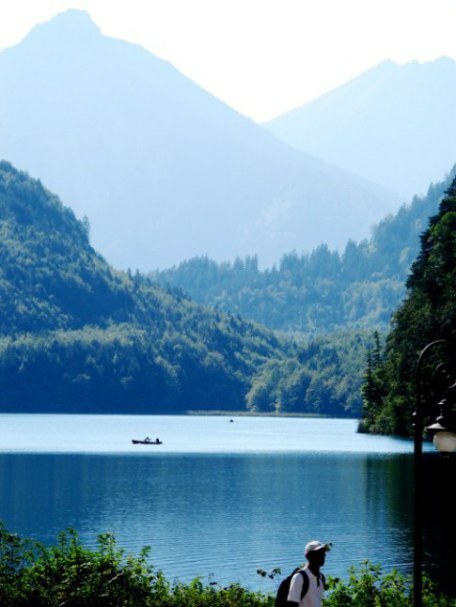 In the early morning, the lake waters blush at the intrusion of the new day as it peeps over the mountain tops. In this delicate light you can stroll about with the locals, savouring this lovely location as your own personal estate. 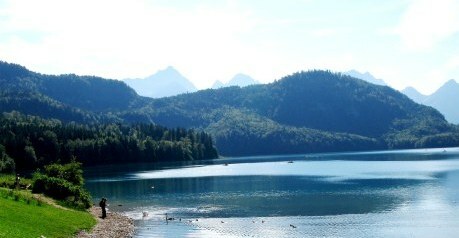 Standing by the Alpsee on a late September morning alone with my camera, I rested my soul in its serenity. The sky had not put on its makeup and was still freshly washed and pale after a light night shower. The hefty rocks on the roof of the onetime stables show that all such storms are not as gentle. 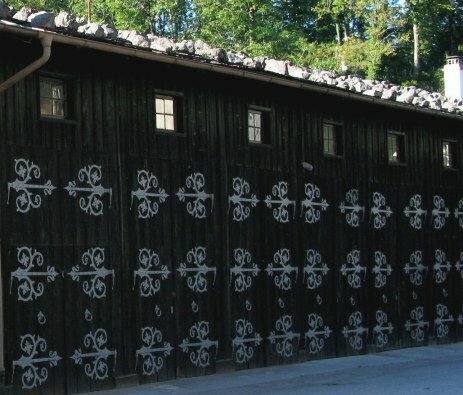 I found the repetition here very pleasing. 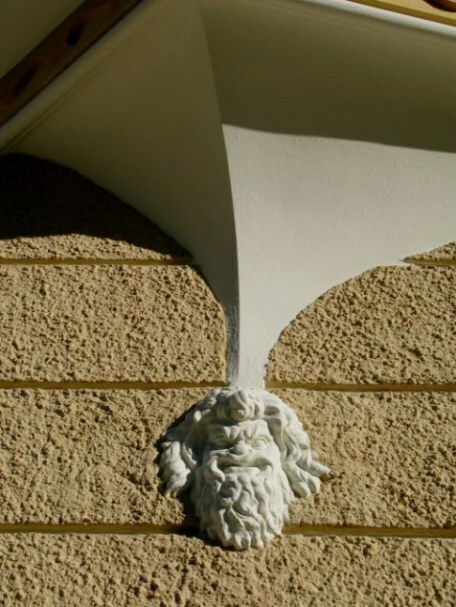 In a similar way, I found the small details of Hohenschwangau architecture and decoration to be delightful. 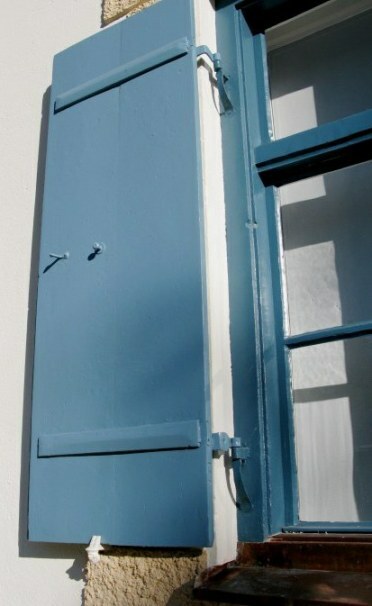 They make perfectly simple shutters into something special. This window cascaded colour into the wakening morning. 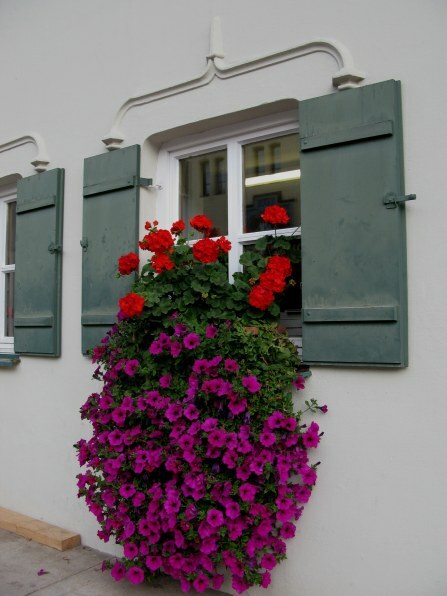 On the doorstep of the Jaegerhaus (hunting Lodge), a colourful early autumn arrangement had been placed on the porch. 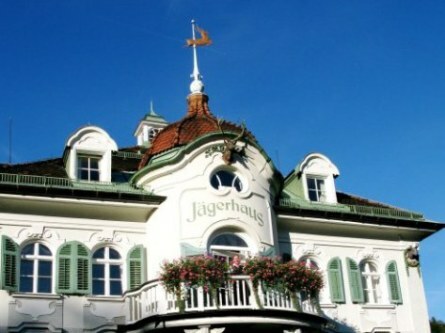 The Jagerhaus is a lovely hotel where most rooms have a view to one or other castle. Further along I noticed this little face at the peak of the support for a corner room – grimacing as if the weight was too much. …and later I discovered that for me, the best part about the street behind was not the very large shop that is located there. The shop sells ‘Brand’ souvenirs with little relevance to the region but high relevance to coach tourists who seek quality items emblazoned with the designer’s name. 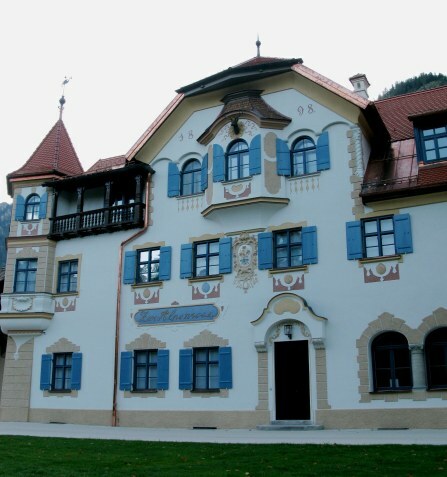 Later, as the day gave colour to the mountain township, I would admire the wonderful pattern of the typical Bavarian architecture against the darkening blue of the sky. We would later stop here for a lazy beer, and just to sit and watch the passing parade. 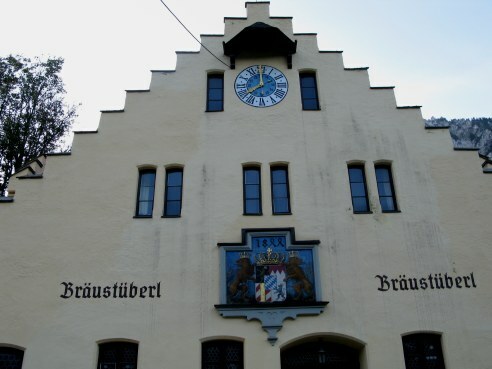 The Bräustüberl pub has poetry of symmetry, and a sturdy and colourful village clock. 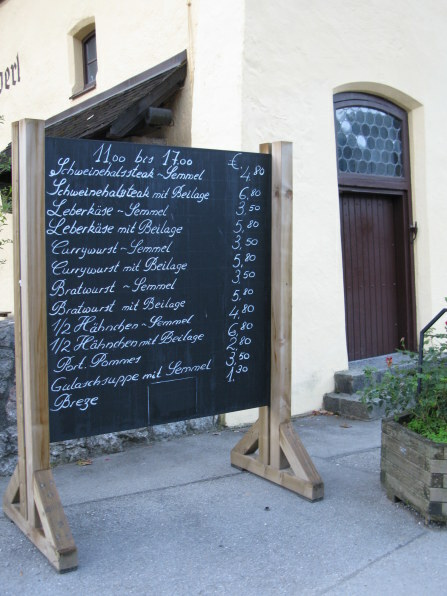 Here, the menu was writ large on a giant backboard, illustrating very reasonable prices for an internationally famous tourist region. 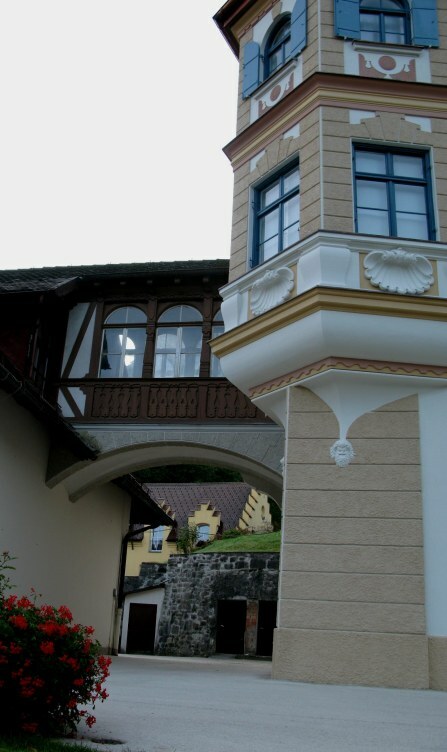 I was interested to see a cuckoo clock mounted outside on the gift-shop lodge below the castle. 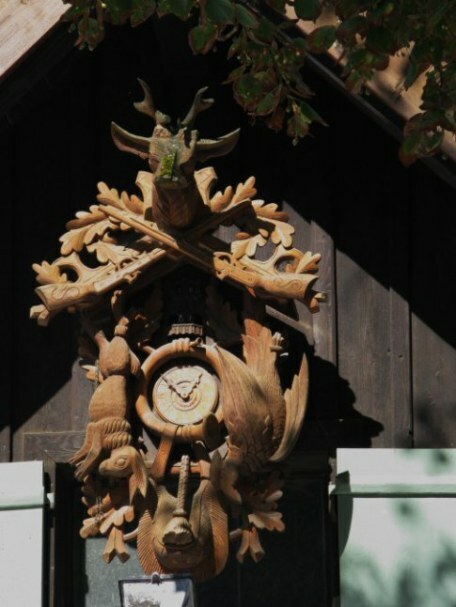 The Black Forest Cuckoo Clock is a famous export from the region of Bavaria. Its origins come from a combination of long winter isolation and the need to generate extra income. 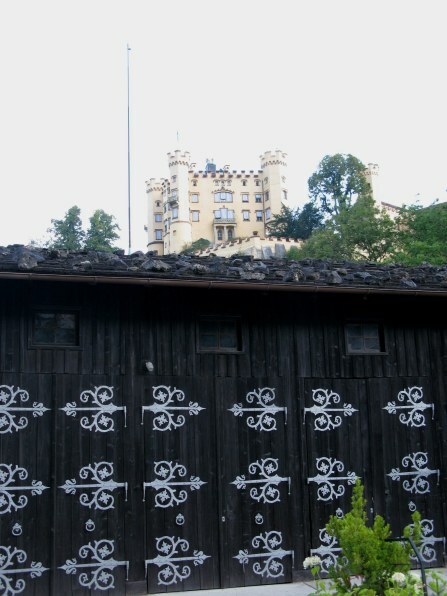 The clock on the building in Hohenschwangau is a classic Black Forest Cuckoo Clock. 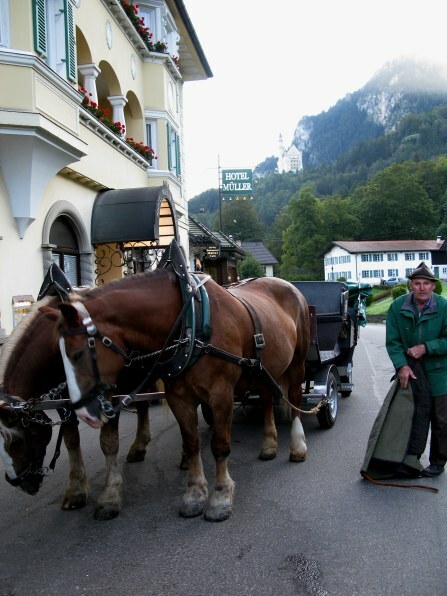 By now the tourists had started to arrive as were the first horse-drawn carriages. 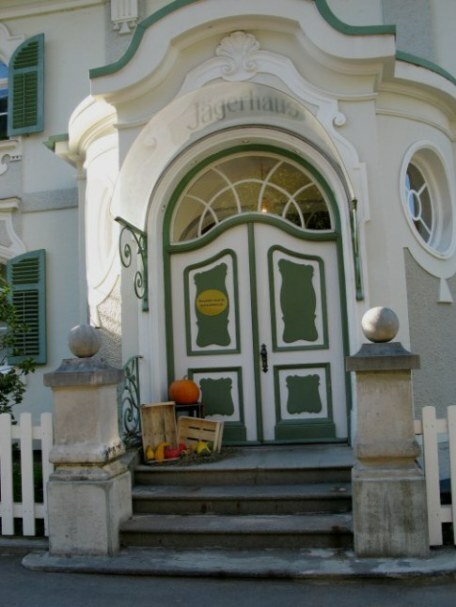 Traditionally, they stop outside the Hotel Müller - which is currently being totally renovated and will not be re-opening until ready: a refreshing schedule. 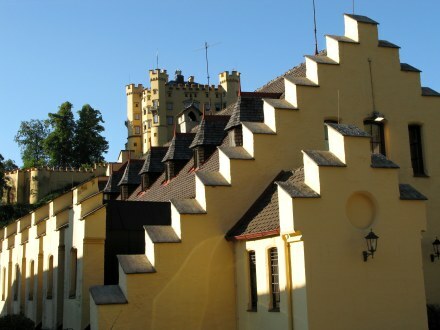 The Müller family have run the hotel since it wa s aguest hosue dealing with the building of the castles. They will do things right and retain the character of their wonderful hotel so that staying and day guests are each well served. 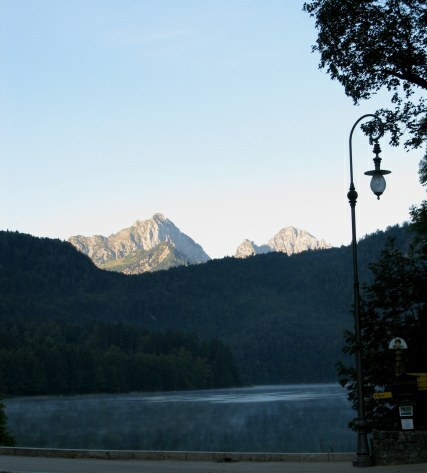 On my first visit we had reserved a place on the first one of the day to Neuschwanstein Castle. … and watched from the terrace above. 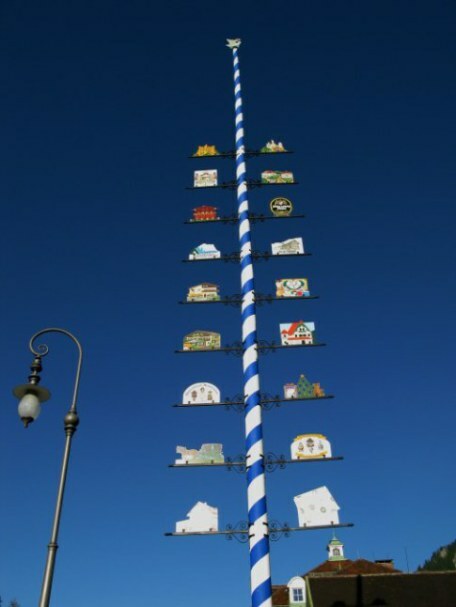 We passed the Hohenschwangau Maypole, which in traditional Bavarian manner had shields of the various businesses and crafts of the town. Colourful flowerpots decorated terraces on the lower part of the road. 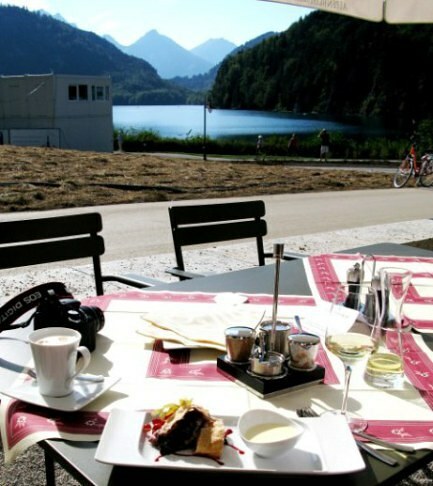 Later, alighting from the carriage back from Hohenschwangau Castle, we headed for the lake for some refreshment. 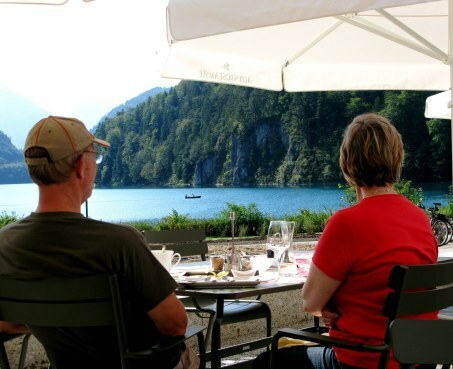 After the two castle tours – first of Neuschwanstein and later of Hohenschwangau – we sat on the terrace of the Alpen Rose restaurant. 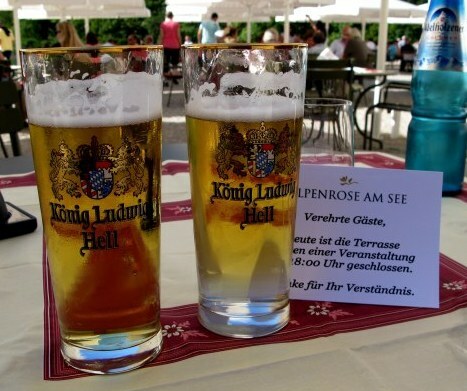 I thought it ironic that the beer served to refresh us as there should be that of the Brewery of the House of Wittelsbach, and that the Ludwig referred to, was not the Ludwig whose inspired dream left us with the magical Neuschwanstein, but his cousin, Luitpold. Luitpold, who became Ludwig III, was placed on the throne after the pronouncement that Ludwig II was incurably insane – as assessed by written evidence without any examination of the person himself. Ludwig II’s brother, the next in line for the throne, was incarcerated for he, it appears, genuinely was insane. His bother’s diaries attest to the increasing level of his concern on the matter. Luitpold, according to court published papers, was an accomplice to the whole King Ludwig deposition - but this has never been confirmed. The documentation has been sealed in a Munich vault. 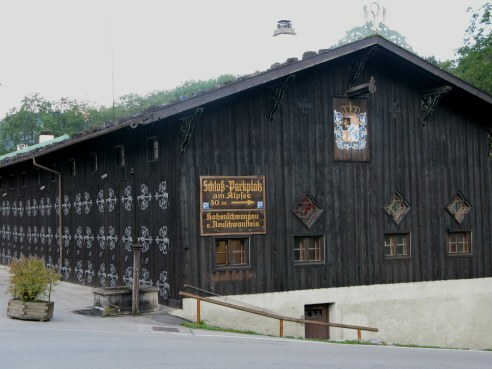 However, the Wittelsbach family has had a brewing establishment from as early as 1260. The beer brewed today has outlasted the trappings of kingship, and used the brand to effect. At any rate, it was a welcome way to quench thirst on a still afternoon where everything seemed to have slowed to savour the last moments of late summer. 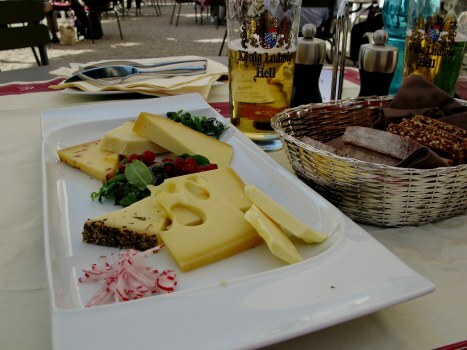 We had ordered a cheese platter, as we had our gala four-course dinner ahead of us at the Hotel Müller. However, my eyes had lingered on the cake section of the menu. A couple were sitting close by, enjoying the views of the lake, and when their cakes arrived I was curious to see what I had missed and asked if I could take a photo. It looked as good as the menu had indicated. 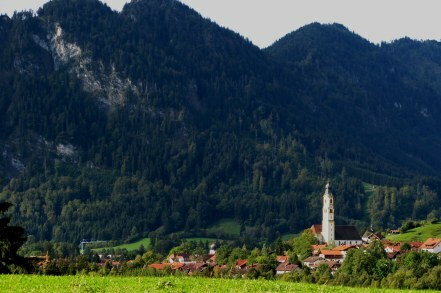 On a tour of the Alps, they had driven over the mountains from Innsbruck but didn’t have the time to see either castle. I am sure it is an omission they would regret despite the beauty of the scenery of the town itself, but they assured me they would not regret the cake! 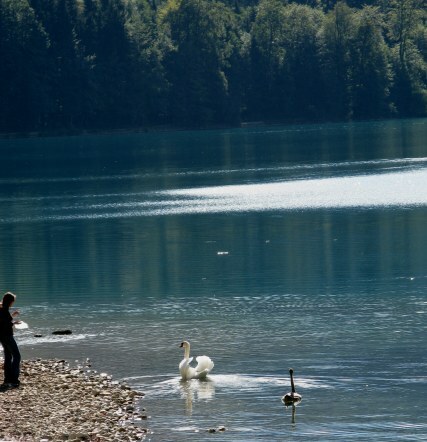 … and of course, true to the name of the town meaning "the high country of the swans" – also watching the swans and cygnets. The swan family had come in a small flotilla at the sight of a willing person to feed them. 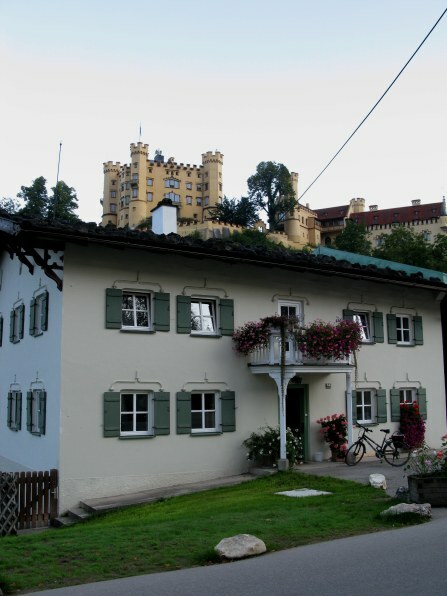 The late summer visit to Hohenschwangau, to its castle and that of Neuschwanstein, drew to a close as the pink mantle of night drew around the mountains, falling softly on the town. As it did, I felt sure that another season would bring me back. My soul had been touched by the visit. Somehow the hospitality, the incredible beauty, and the serenity endure, despite being visited by more than 1.3 million people a year (that’s like having the whole population of Milan, greater Oslo, or Dallas on your doorstep). 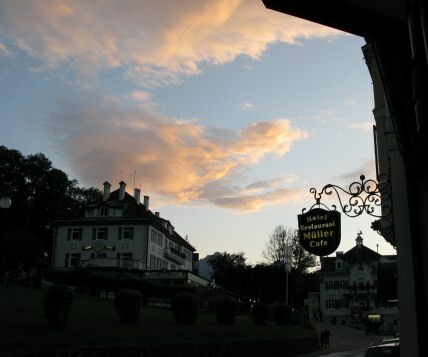 Perhaps the long evenings - when the population is limited to those within the few hotels and to the locals - refresh the town of Hohenschwangau. This is when, after the last tourist of the day leaves, a stillness descends under the soft colours of twilight. 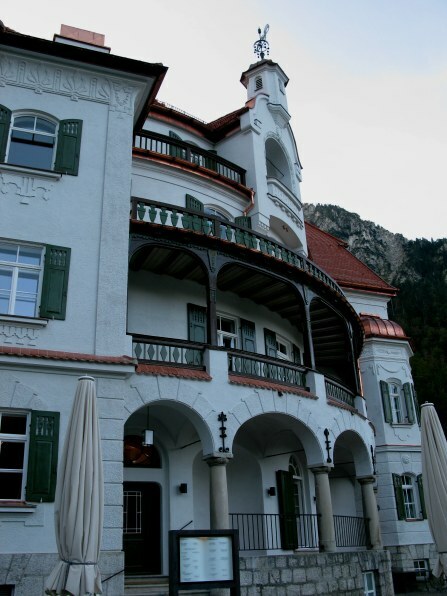 Hoheschwangau, its castle, and the lovely lake called the Alpsee are special in their own right, but it is especially the castle of Neuschwanstein that touches something in our soul. We all have our own fairytales within us. Oh, but that we would let them be written.